REEL Youth Film Festival. Featuring a few dozen films from filmmakers under the age of 20 from all across the globe, the REEL Youth Film Festival was fascinating, particularly as someone who has a passion for both films and the emerging generation. Documentaries, animation, public service announcements, and short stories were included, ranging from filmmakers as local as New Westminster and as faraway as India, Iran, and Sierra Leone. Despite the global diversity, the style and themes from youth filmmakers were surprisingly consistent. There was a *lot* of narration and voiceover, indicating a youthful desire to express unspoken internal feelings and musings. Key subjects included identity questions, sexuality and romance, anxiety and depression, and bullying. This latter theme was so prevalent it almost became monotonous--bullying and social pressures were often the overt focus in the films. There were at least two "unplug" films exhorting the viewer to take a break from technology and screens. Underlying many of the social issues was a theme of justice, i.e. doing the right thing. Whether it was taking care of the environment or standing up to bullies, these teen filmmakers expressed a desire to see moral balance and fairness in the world. Passionate, diverse, eager, creative, and at times a bit confusing and too overtly clever, these adolescent films and filmmakers showed great potential. Ranging from the hilarious to the depressing, the affecting and the obnoxious, the festival was directly in a youth worker and cinephile's sweet spot. Horse Money (Pedro Costas). This is the most challenging film I've witnessed at VIFF, and perhaps one of the more provoking films I've ever seen. Hallucinatory, foreboding, haunting, and enigmatic, Horse Money is an exercise in endurance and disciplined film-viewing. 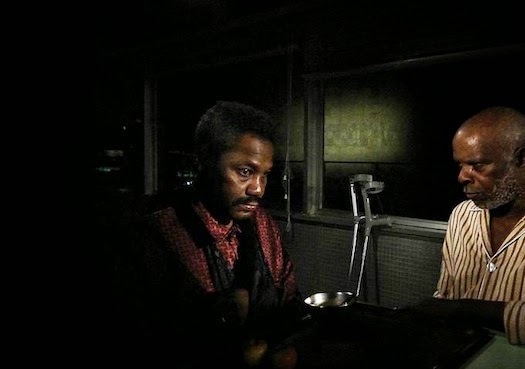 Focusing on Ventura, a key character in Costas' previous films (none of which I'd seen before), Horse Money is like a living nightmare as Ventura wanders the dark hallways of a hospital/asylum/purgatory, colliding with ghosts of the past. The film defies classification, and I wasn't sure by the end whether it was brilliant or a bore...or both. Essentially, the film is a series of dream-like scenes and dialogues, culminating in a long internal "conversation" between Ventura and a living toy soldier in an elevator, told in voiceover and with multiple personalities. Costas is less focused on telling a direct story and more on eliciting feelings through images, flashes of memory and moments and emotions. There are some striking images and moments, particularly a scene where Ventura is wandering the darkened streets of his Portuguese neighborhood in his underwear, followed by a tank and armed soldiers. If you're interested in challenging yourself through a hallucinatory journey into darkness, Horse Money is your film and Pedro Costas is your filmmaker. Maps to the Stars (David Cronenberg). A satire about the gruesome and dismal side of glitzy Hollywood stars, Maps to the Stars is a film about selfish, greedy people doing self-destructive, greedy things to each other. Perversely funny, it revels a bit too much in its denouncement of Hollywood culture, containing zero likable characters and leaving the viewer with a lingering sense of despair. Now, a film can be darkly comic and have no truly likable characters and still be a worthy film--some of Lars Von Trier's films come to mind--but Maps to the Stars is an exercise in deliberate depravity. There's a solid ensemble cast here--Julianne Moore, Mia Wasikowska, John Cusack, Robert Pattison--and Moore stands out in her portrayal of a neurotic, washed up actress (she won Best Actress at Cannes). She's a plastic person, someone who smiles for the cameras and acting acquaintances, yet rejoices at the death of a child or the pain of others. Haunted by the past--this is another film where ghosts appear in hallucinatory moments--Moore and company are all in a downward spiral into insanity, culminating in their own destruction. 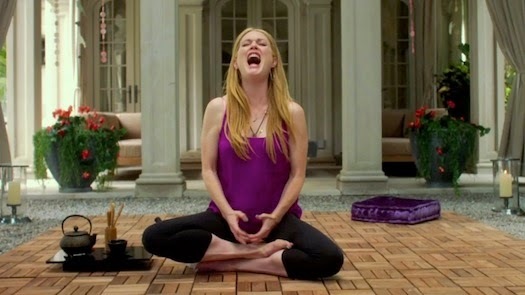 For all its comedic bite, Maps to the Stars felt like reading a bitter letter sent to an ex-lover, a despairing and harsh look at a self-centered Hollywood subculture. More nuanced and thought-provoking films have been made about the delirious madness of Hollywood, particular Sunset Boulevard or Mulholland Drive. And if you're anticipating Cronenberg's signature violence, it's here, brief but graphic. I generally appreciate Cronenberg (A History of Violence and Eastern Promises are both remarkable), but this was my least favorite film of VIFF thus far.